We feel that it is very important for this book to be in print, in your hands, and right in front of you in your kitchen. In fact, I can’t wait to have it in front of me in my own kitchen! It is the resource so many of us (including me!) have been needing for so long! Because this kitchen resource is designed to be your “go-to” book, we chose to have it professionally printed and spiral bound. Oh, For Real is printed in full color, on 8 1/2 x11 inch pages – with pictures, tutorials, information, and of course – lots of recipes. It isn’t fancy. It isn’t overwhelming. It’s just me sharing “how I do it” when it comes to feeding my family a healthy diet on a limited budget and with limited time. 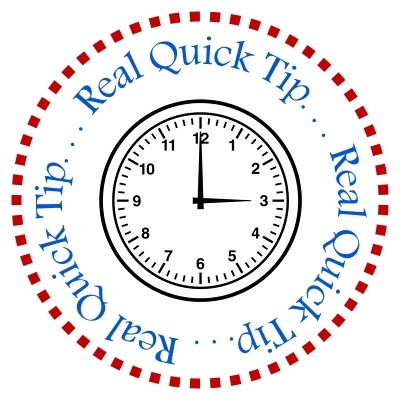 In addition to all the recipes and helpful information we’ve organized in the book, you will find “Real Quick Tips” sprinkled all throughout, which will provide you with simple ideas for getting ahead and saving time in the kitchen. 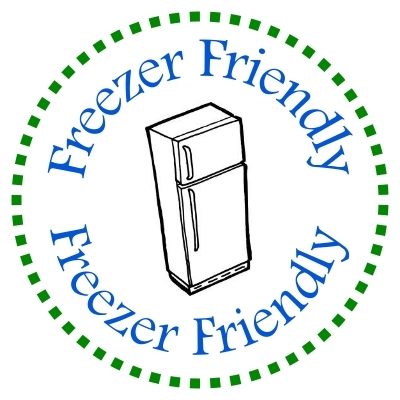 Each time you see the “Freezer Friendly” button in the book, you can learn with a quick glance how to prepare that particular recipe for the freezer, and how to reheat it when you are ready to serve it. What will you find in Oh, For Real? Care to take a little peek inside? Click here for a preview. This 100 page book is being printed for the absolute best price we could find for the high quality, full color pages we desired. (Black and white just wouldn’t cut it on this!) It has a plastic cover to protect it in your kitchen, and my favorite feature: spiral binding so that it will open up and lay flat on your kitchen counter while you’re using it. This is not a book you will read once and stuff on your shelf, never to be read again. This is more than a cookbook. Oh, For Real is your real food resource – the book you will reference over and over as you develop and/or maintain your healthy, whole foods kitchen. Our price includes shipping, so no need to figure in additional postage to the price below. If you are from outside the U.S., please email me regarding additional shipping fees. Wait no longer! Order your copy right away! Cost for a book shipped to Canada is $34.05. If you are from Canada or another country outside the U.S., please email me before purchasing. Thanks! Just pre-ordered the book…YAY! Is there an expiration date on the BONUS $10.00 certificate? I am in the processes of putting my e-books in seperate folders, and would like to wait and see what I have, and what I don’t have. Hope I can wait a few more weeks on using the certificate – please let me know Laura. Congratulations on your book, and may it be very successful! Thanks for your purchase and for your encouragement! :) The code expires March 31, 2013. What is the $10 certificate? Is it $10 off the book or something else? I am thinking I will order the cookbook, but if there’s a discounts, I’m in. How exciting! I’m about to pre-order right now! Thanks for the bonus! Good work! I’m just curious, can you explain the benefits of the book over your website? This book summarizes what the almost 3000 posts on my site have said, making it easier to find all of the information about freezer cooking and getting ahead in the kitchen. Plus it organizes all of the recipes in one easy spot. AND, there are additional recipes in the book that aren’t found on the website. Hope that helps answer the questions. Let me know if you have more! I just pre-ordered! Can’t wait to get this book. Thanks, Laura. I just ordered and I’m soooooo excited! Congrats and thanks for the bonus…You’re awesome! Ordered my book!! Yippee!! :) I can’t wait to receive it! Congratulations and thank you for the bonus!! I ordered my copy. Seriously, I cannot WAIT to get this book! Wonderful that you put this together for us. Love you and your blog, Laura!! It sounds like it is a great gift idea for someone starting out to eating healthier, but I’m super thrilled with your website and the ease of finding things quickly. It’s right next to my Bible, literally, haha! :) I want to support anything you do so I think I’ll think of a friend or two who might really benefit and is interested. Thank you for all you do Laura and for sharing! Yay pre ordering when I get paid on the 15th!!!! Cannot wait to meet you in Branson! wishing the coupon expired later than March 31st. That doesn’t give enough time to get the book and look through it to make sure I don’t order and ebook that has info that is in the book. May be a foolish question but is shipping included? Looking so forward to buying your book! We’re literally in the middle of another (and hopefullly final) move…so the minute we’re packed up and have unloaded the U-haul,I plan on ordering your book:) Best wishes to you and your continued success! I’m trying to order your book…is paypal the only payment you accept? Thank you so much for the time and effort you have put into this book! I really appreciate your web-site and have learned so much from you over the last 15 months. I’m so looking forward to having your recipes and other information in one place…my kitchen! Thanks again! I’m so excited about this. Perhaps my laptop will be safe from the flour it usually is dusted with. I’m SO glad you are making this book! Can’t wait to get mine! I just pre-ordered mine!! Yay! I love all your recipes, but I will be so happy to have a book to look at. Thanks for all your hard work. Your preview copy looks lovely! I am so excited to get a copy of the “fruit of your labors” into my own hands. This will be such a help as I already use so many of your recipes anyway and am constantly running to your website to look one of them up. Just pre-ordered my copy! I don’t really ever comment here, but I’m trying to get my own diet moving more toward whole foods, so I think this will be an invaluable resource. Thanks for everything you do with the blog! I would like to order this, but I’m wondering what percentage of the recipes are gluten free, or easily adaptable? I get so many great recipes from your website, and cherish the gluten free ones! Great! Thank you! I think I’ll have to pick up a few as gifts also! I also thank you, Laura, for your time and effort in putting this book and all your information together to bless us. I have recently been “downsizing” my email acct., and have unsubscribed to most of the other unnecessary emails. Yours is the only blog I will continue to receive, as I find it practical, humorous and encouraging. I have been using so many of your recipes for the past few months, and was about to put all my miscellaneous recipes into a binder. Now I will wait to see which ones are in your new cookbook before I complete that task. I’m excited to have it all in one convenient place (and I still like a “real” book in my hands, esp. for cooking). I will recommend your new cookbook to others! Hello, I’ve just pre-ordered your book! I love your blog and your recipes. I use so many of them for my grandsons, ages 13 and 9. Big hits are the Giant Breakfast Cookies and Breakfast Cake. However, they like many of your real food meals as well, not just the “fun” stuff! Thank you so much for writing this book; I’m anxious to receive it, read about your “real” family, and have easy access to so many of your recipes. Keep up your good work! Thanks for letting us know. Congratulations! I just made my pre-order for the book. Looking forward to receiving it and trying some more recipes. I am always looking for healthier ways to feed my three boys. Just ordered. Am excited. Thanks, Layra! We’re giving this some thought, mostly because we haven’t figured out a download price and policy yet. We are really encouraging printed copies because this book is best in printed form. Would you mind emailing me so that I can email you back just as soon as we’ve made our decision in a few days? Thank you!! I just pre-ordered! Will there be a follow up email with info on the $10 e-book/course credit? Yes, you should have received an email. Did you get yours? I did! It just took a little while (probably because of the way our email is set up). Thank you so so much for all of your hard work on this and on your blog. It has been such a blessing to me and my family! Just ordered a copy for a friend that doesn’t use Paypal…Already ordered one for myself! Just ordered a copy and I am very excited!! I think this will help me use more recipes instead of having to use the computer so much. I got my book this afternoon and it is amazing….For Real! I have already read it cover to cover and I will be in the kitchen tomorrow. I’m so excited. I will be recommending this book to all my friends. For Real! preordered and super excited, can’t wait til it gets here! WOO HOO! We moved into our new home and are halfway unpacked, now I’m about to treat myself by ordering your book! Since my credit card has a separate address (billing) than my current address (shipping), it wouldn’t go through. I didn’t see a separate option for a shipping address. Please advise :) I know I may have to wait until I update my address. Just wanted to thank you for compiling and PRINTING in a desirable format your best tips and recipes! So many Godly women have great things to share, but they often piece-meal it via e-books that have just never been user-friendly or complete enough. Having a printed version of your practical wisdom will be useful and something that will not be forgotten due to its inaccessibility. Blessings! As follow-up, I received your new book, For Real, and was so pleased after reading it through. We have the same methods, but what I was lacking were good recipes using whole foods. So many of mine are my adaptations of recipes calling for AP flour, and they just aren’t the same. I tested my first two recipes of yours–Crispy Baked Chicken using your Ranch Dip Mix and your Fudgy Brownies. I have tried both of these from other sources before–big fails! BUT, yours were a hit! My Wonderbread-raised hubby was reluctant to even try the brownies. He looked at me skeptically and asked, “Do they have whole wheat?” I admitted that they did, and he waited until the children started raving about them to give them a try. He was won over. I love the simple way that you organized the information, making clear in which recipes each mix could be used, and giving clear instructions with each recipe, including freezing and reheating. I can’t wait to try more. Job well done! can your book be ordered for an Ebook or to download it to my kindle? I do not have room to store many books & would love an electronic version, if available. I am saving for this book! It may take me 6 months of putting back a few dollars a month to get it, but I will own this book! My family loves (almost) every single one of your recipes that I try and it would be great to have them all in one spot! I would really love to buy your book but have had multiple bad experiences with Paypal and refuse to do business through them anymore. Is there any other way to purchase the book? Am I still able to order this? I have finally (through a gift) been able to save enough money to order this and I was wondering if it was still available. hi, just wanted to say i got my book yesterday! After while of following your blog and printing out the recipes for my family (the love them all), its wonderful to have everything bound in one book. You are a real inspiration. I appreciate how much time it must have taken out of your already full schedule to produce this book. Thank you. I wanted to purchase your e-book, but I need to know if you ship to APO boxes. It looks like a great resource for our newfound attitude towards better eating. I just bought the Ebook overload. I am wondering if this is much of the same in recipes, or are they different? I am considering ordering this one as well, but wouldnt want to if all the recipes are the same. Thank you for your time and resources! Hope that helps answer the question! I would like to get this for my ddaughter for a Christmas present, however, when i go to checkout it only has PayPal. I don’t have PayPal. Is there some other place i can get this book? If you’d like, you can send me a check. Email me at laura at heavenlyhomemakers.com for my address. Thank you! I would like to buy a copy of this for a friend of mine (I already have a copy and LOVE it!) for Christmas, but I am wondering how long it will take for it to ship out. Do you think I would have it in the next week to week and a half? Is the link still good to order a book? I just wanted to verify because it looks like it but the website changes to ejunkie or something like that and I am so leary of things on the internet sometimes. 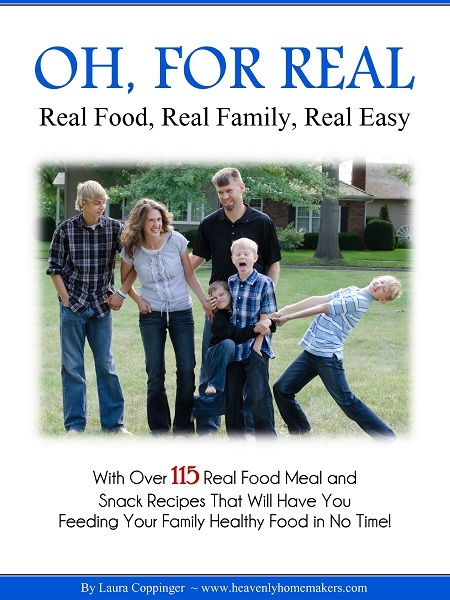 How useful would this book “Oh, For Real” be for someone that has to eat gluten free? I just wanted to let you know that I adore your cookbook. I ordered it about 2 years ago and have been using it since. I love that the recipes are so simple my 11 year old can make them without any help from me. I love that there are only a few ingredients – SO SIMPLE! Love, love, love it. Thank you.